#GiantFPSO - Work on another oil rig completed by Harland & Wolff in 2012 had helped clinch the multi-million pound Blackford Dolphin deal, writes The Belfast Telegraph. 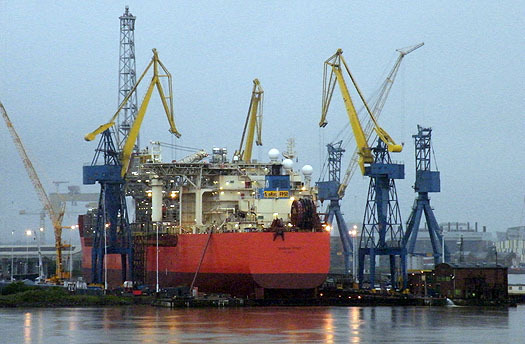 One thousand workers helped completed the one-month project on the SeaRose FPSO "floating production, storage and offloading vessel" for the Canadian firm Husky Energy. As pictured above by Afloat.ie, the giant floating factory left Belfast four days early, under budget and with no injuries or environmental incidents, before sailing to Newfoundland. Once the current job is completed, the Blackford Dolphin as previously reported on Afloat.ie will move to the North Sea, where it will begin its next drilling contract with MPX and Capricorn, respectively. Despite the decline in shipbuilding, Harland & Wolff is carving a new niche in the offshore and renewables markets. The most recent ship built at the yard was the MV Anvil Point, which left Harland & Wolff in 2003. It was owned by a consortium including the Bibby Line company, ironically the owners of the Venetian, the very first ship built by the Belfast shipyard.